Despite being an adaptation of a movie, Billy Elliot is a fun and moving musical with spectacular choreography. I saw this same production on tour at the Orpheum two years ago and wrote a fairly extensive review of it at the time, so I'm not going to go into that much detail here. It's pretty much the same production with a different cast, and I agree with what I said last time. You can read that review here. Below are a few highlights of the tour that's currently at the Ordway through this weekend. In a nutshell, Billy Elliot is an adaptation of the 2000 movie of the same name about a young boy in working class England who finds himself through dance, while his family and tight-knit community is going through the coal miner's strike of 1984. The best part of this show is the choreography. It's edgy and unique, unlike anything I've seen elsewhere. You have the ballet that the kids are learning with varying degrees of skills, mixed with the rough movement of the miners and cops. It's really something to see. The stars of this show are the children. Four Billys are on tour with the show, and I saw a young lad named Noah Parets, who was incredible. He carries this show and has some difficult and energetic choreography. I particularly love what I like to call "the angry dance," where Billy is so angry he can only express it through dance, as he bounces off walls and taps around the stage. Later he dances with an older version of himself in a beautiful ballet, and literally flies through the air. I think my favorite scenes of this musical are those involving the little girls in the ballet class. Who can resist little girls in tutus and pigtails with foul mouths?! Not me. They perform with the awkward grace of your average children's dance class, but I suspect that they're actually a lot better than they pretend to be. The adults are good too, particularly Minnesota native Janet Dickinson as Billy's ballet teacher, Patti Perkins as his Grandma, and Rich Hebert as his tough love father. The set is quite effective in creating the spaces where the story takes place. The main set is the community center/gym where the town meetings and classes are held, with walls opening up or moving in and out to expand the space when needed. 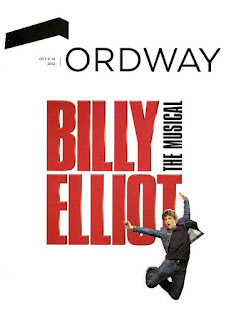 Billy Elliot is a great big musical, and a successful adaptation of a small cult hit English movie (although I still think Next to Normal should have won the Tony that year!). For more details you can read my past review. And if you're interested, act fast, this one's only here for one week!